Abstract: In this GeForce Titanium lineup review, we're going to look at three new models from MSI. While MSI is best known for their bright red motherboards, they also produce a lot of performance oriented videocards. In this GeForce Titanium lineup review, we're going to look at three new models from MSI you'll want to pay attention to. As many of you already know, with the release of nVidia's GeForce "Ti" series line of graphics processors, things have gotten quite confusing in the video card marketplace. There's the regular lineup GeForce 2 and GeForce 3 videocards and now there are also the GeForce2 Ti, GeForce3 Ti200 and GeForce3 Ti500 video cards to contend with. It's almost as confusing as watching a 50 year old trying to buy an action figure for their grand kids. So what's the beef with these all new 'Titanium' names? Well, to put it in its most basic terms, the Titanium GeForce GPU's are essentially nVidia's counter to ATi's Radeon 7500 and Radeon 8500 GPU's. Here's a brief breakdown on the different GPU's and what the cards include. 64MB DDR SDRAM, 3.2billion AA samples per second fill rate, 6.4GB/second memory bandwidth, Core/Memory speed 175/400 MHz, Support DirectX 8.1 and OpenGL 1.3 Optimizations. TV-Out, Video-in, S-Video. 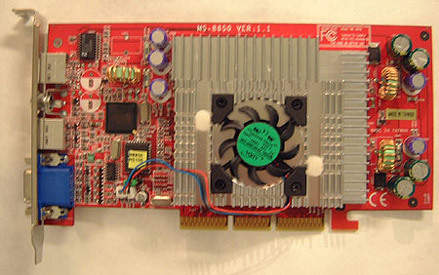 64MB DDR SDRAM, 3.84 billion AA samples per second fill rate, 8.0GB/second memory bandwidth, Core/Memory speed 240/500 MHz, Support DirectX 8.1 and OpenGL 1.3 Optimizations, TV-Out, Video-in, S-Video. First up to bat is the MSI GeForce2 Ti. It's simply a renamed GeForce2 Ultra core that runs at 250 MHz, backed up with GeForce2 Pro memory that hums along at 400 MHz. It's common knowledge that the GeForce2 line of cards are all memory bandwidth limited, so it's quite easy to predict that the GF2 Ti will perform close to the GF2 Pro since they share the same memory. Also, contrary to some rumors on the web, the GF2 Ti does not have any "extra" features built into the core that the older GF2 based cards don't have. The MSI G2Ti Pro-VT is probably one of the most feature rich GeForce2 Ti's out there. Sporting a beautiful bright red PCB, the card has Video in and Video out curtsey of the popular Phillips 7108E chipset. However, the nicest feature was the Hynix 4 ns ram! Hynix are the second largest memory manufacturer after Micron and are beginning to see a lot more exposure in North America. Since the reference design only calls for 5 ns RAM, it's nice to see that MSI is equipping their cards with faster memory. One thing to note though, early versions of the 1.1 PCB come with 5ns RAM and only in the newer version do they come with 4ns RAM. All the goodies the G2Ti came with are shown above. Next up is the GeForce3 Ti200. This video card probably offers the best value of the whole bunch. Basically, with the GF3Ti200, nVidia is trying to bring consumers "GeForce3 performance for ½ the price". Do they accomplish this? Not quite, however it's damn close! With a core frequency of 175 MHz, down from the 200 MHz the regular GF3, the memory is also clocked at 400 MHz just like the GF2 Ti. One thing to consider however, even though some companies equip their Ti200's with the same speed RAM as the GF3/Ti500, the Ti200 will never clock as high as the more expensive cards because both the GPU and memory on the Ti200 receive less voltage then in the GF3/Ti500. 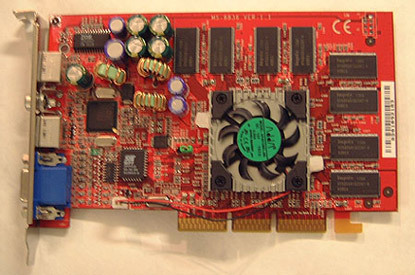 The G3Ti200 Pro-VTG, like most MSI products these days uses a bright red PCB. The card features video in and video out capability care of the very popular Phillips 7108E chipset. It's really obvious here with the Pro-VTG line of cards, MSI is taking direct aim at Asus's "Deluxe" line of cards since this card also comes with 3D stereo glasses. Unlike Asus however, it's not necessary to use the manufacturer's drivers, the 3D glasses worked fine with the reference nVidia drivers. There is a need to use a riser card, so using the 3D glasses will take up an extra expansion slot, which is usually not a big deal. While it is a nice touch to have large ramsinks and a GPU heatsink, I found it rather odd that between the GPU and heatsink was a thermal pad! It was rather surprising because the MSI GF2 had thermal compound (much better). Anyway, as you can imagine, this would probably inhibit overclocking a little, especially at the core.